Too bad the majority in Whatcom County Council voted to ban wind power turbines in county agricultural and forestry zones; so I hear. Still allowed in industrial zones, but will that be enough space? What's the problem? Are wind turbines not considered aesthetic? Can't they be viewed as wind sculptures by a more open minded population? We have some wind sculptures in Bellingham. 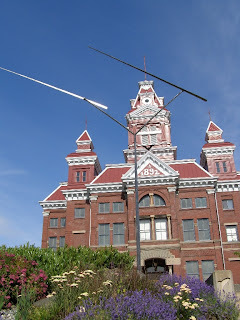 This one pictured near Whatcom Museum of History and art. Maybe they are also worried about bats getting caught in the turbines, but there are ways to reduce that problem. If we want to curb global warming and have greener energy, we have to be able to accept change. Change in the landscape. Wind turbines can be seen as artistic. US is getting more serious about actually tapping alternative energy. As for the view, items to capture wind can be viewed as art. 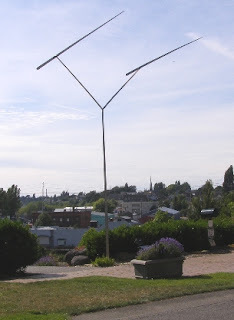 For instance this wind sculpture at the Bellingham, WA. transit terminal. Good Bellingham Herald article explaining this situation. Published November 19.